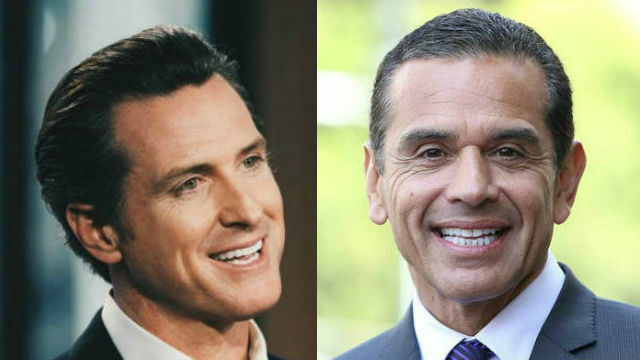 Democrats Gavin Newsom and Antonio Villaraigosa are virtually tied as front-runners four months before California’s June 5 gubernatorial primary, according to an influential new poll. The poll of likely voters by the Public Policy Institute of California shows Lt. Gov. Newsom with 23 percent to former Los Angeles Mayor Villaraigosa’s 21 percent — a statistical dead heat. State Treasurer John Chiang was third with 9 percent. The top Republican challenger, Orange County Assemblyman Travis Allen, is a distant fourth with 8 percent. Under California’s nonpartisan blanket primary law, candidates from all parties appear on the same ballot. The top two finishers advance to the general election in November. “Two Democrats are in a virtual tie in the top-two gubernatorial primary. But a quarter of likely voters are undecided—as many as support either of the front-runners,” said Mark Baldassare, president and CEO of the police institute. Villaraigosa has risen since the last poll, when Newsom was farther ahead, with political observers suggesting this is due to growing interest by Latino voters in the wake of President Tump’s anti-immigration rhetoric. In the race for the Senate, incumbent U.S. Sen. Dianne Feinstein continues to lead fellow Democrat Kevin de León, state senate president pro tem, by double digits. The latest poll shows a 46 percent to 17 percent margin with 33 percent of likely voters undecided. The findings are based on a telephone survey of 1,705 California adult residents, including 1,194 interviewed on cell phones and 511 interviewed on landline telephones. Interviews took place Jan. 21–30 in English and Spanish. The margin of error is 4 percent for likely voters.